Dashain is the 15 day Hindu festival celebrated in Nepal. It is the longest Hindu festival and it falls around September – October, starting from the bright lunar fortnight and ending on the day of full moon. Dashain is also popularly referred to as Bada Dasain, Dashera, Vijaya Dashami etc. This year Dashain starts today, 16 October which is Ghatasthapana (Literally pot establishing). Ghatasthapana is the first day of Dashain and it is the day in which Jamara is planted on a pot or Kalash. The other important days for the festivals are Day 7 called Fulpati (21 October), Day 8 called Maha Asthami (22 October), Day 9 called Maha Nawami (23 October) and Day 10 called Dashami (24 October). The festival ends the 15th day with Purnima, full moon. Every year Nepalis, remember the message “Good always wins over the evil”, with the celebration of the great festival of Bada Dashain. King Ram Chandra, whose wife Sita was kidnapped by King Rawan, with the help of hanuman and its military, conquered Rawan on the tenth day, after regular worship of Durga Bhawani for 9 days. The 10th day is the victory day. We put tika on our forehead as prasad of the victory. Another legend goes like this. Demons, or Asuras, became very powerful and ambitious and continually tried to defeat the Devas, or Gods, and capture Heaven. One Asura, Mahishasur, in the form of a bull, grew very powerful and created havoc on the earth. Asuras started defeating the Devas and chasing them away from the heaven. The world was crushed under Mahishasura’s cruelty; the Devas put their energy together and form Shakti, a single mass of incandescent energy, to kill Mahishasur. A very powerful band of lightning emerged from the mouths of Brahma, Vishnu and Shiva and a young, beautiful female virgin with ten hands appeared. All the Gods gave their powers and special weapons to her. This Shakti blended to form the goddess Durga. Riding on a lion, Durga Bhawanu fought Mahishasur. The battle raged for nine days and nights. Finally on the tenth day of Ashvin shukla paksha, Mahishasur was defeated and killed by Durga. This is the day of celebration. Ghatasthapana marks the beginning of Dashain. It literally means installing a pot which symbolizes Goddess Shakti. In this day, Jamara is planted establishing the holy Kalash vessel, which represents the goddess Durga. Goddess Shakti is believed to reside in the Kalash vessel during the Dashain. 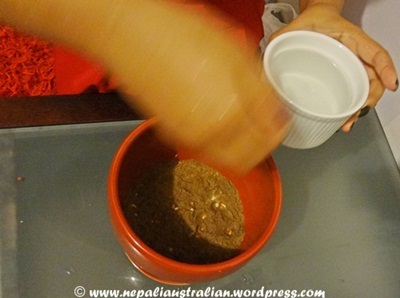 Today, everyone in Nepal will plant Jamara to mark the start of Dashain. Normally, Jamara is planted in Puja ghar (prayer room). Jamara pot is kept away from direct sunlight, and holy water is offered to it every day, so that by the tenth day of the festival the seed will have grown to five or six inches long yellow grass. This sacred grass is known as Jamara. Today, before coming to work, I planted my Jamara as well :). It is the second time I have planted Jamara and I am hoping like last year, it will be a good one so I can use this for puja and tika . 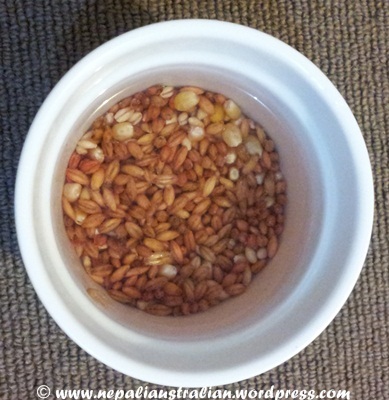 Soak barley seeds overnight. 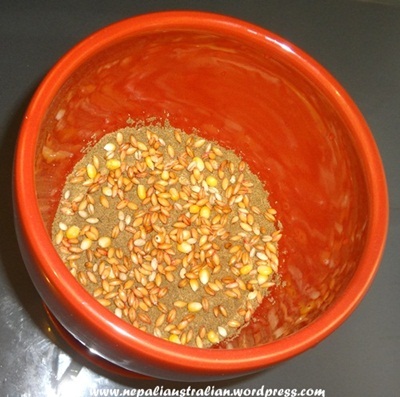 I used a Jamara mix (barley, corn, wheat) from Nepali grocery shop. 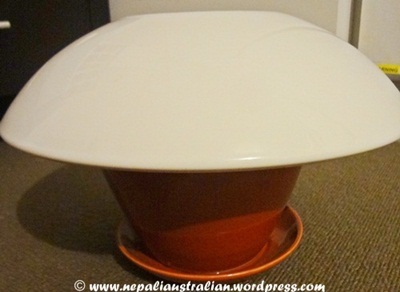 Get a deep bowl or container with a flat bottom. I am using a clay flower pot this year. Fill it with a layer of sand about 2 inches thick. 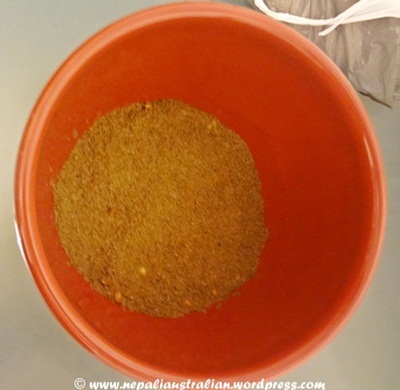 Sprinkle a layer of soaked Jamara mix into the container. 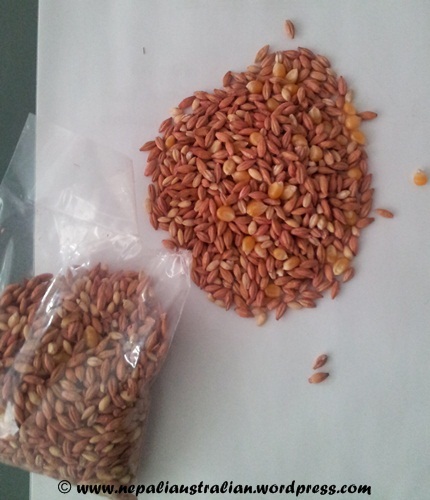 Make sure it is only one layer of the seeds so they have enough room to sprout. 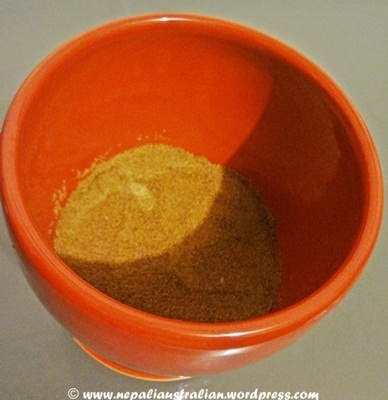 Cover the seeds with a thin layer of sand. Sprinkle some water in the container. The sand should be moist, but not soggy. Cover the container and put it in a dark corner, away from the sun. Check the container daily to make sure that the sand is moist. Your Jamara should be is ready for Tika. Click here to see how Jamara looks like from my last year’s post. If you are in Nepal, you will see lots of signs of Dashani which will remind you that the festival season is on. Flying kites has been a very important part of celebrating Dashain in the country as it is considered to be one way of reminding god not to send rain anymore. When I was a kid, we used to gather on the rooftop of the house and take turns flying kites. My brothers and his friends would be there and I would be there trying to learn how to fly kite. They used to teach me but most of the time I dropped the kite too low when I was taking control and one of them would jump in and take over before someone could cut it in the sky, with so many kites fighting already. When you cut someone else’s kite, you shout ‘Changa Chet‘ literally meaning Kite, cut! If we had a big group of friends we even used to take metal plates or metal buckets with metal spoons and bang them to make a loud noise to celebrate the Changa Chet. I know it might sound weird but it was lots of fun. 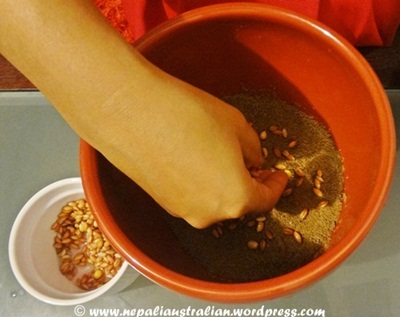 Ohoo, how I miss my childhood Dashain. Kites are not only for kids but adults get into the spirit and have some fun too. Gambling is illegal in the Nepal but it is usually permitted in public places during this festival. While children are busy flying kites during Dashain, the older members of the family pass their time by getting together and playing cards with each other for money and fun all day long. As a kid, I remember playing cards using 1 shuka (a quarter /25 paisa) and trying to win more money. It was so much fun to team up with the cousins and play it as a group. That is the only time we didn’t get scolding from our elder for playing cards. Buying and wearing new clothes is an important part of the festival. As many people are living in the villages below the poverty line and for them it is often the case that new clothes come only with Dashain. Almost all the shops in the country have festival offers and discounts. This makes shopping even more attractive to people. Clothes have the highest sales during the festival. 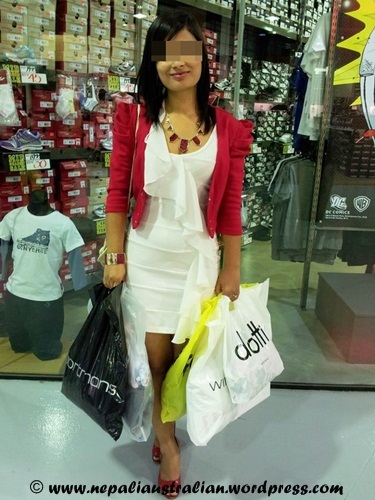 To get into the Spirit of Dashain, we went shopping last weekend and I bought two dresses and a pair of shoes. My husband bought a jacket and a few t-shirts :). I am wearing my new dress today so Dashain has already made an impact in our lives. 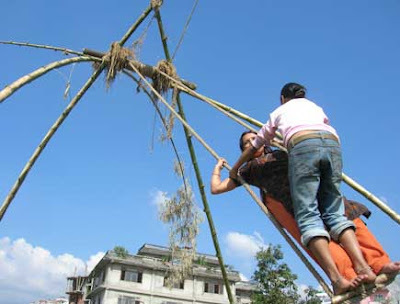 During Dashain, bamboo swings are constructed a week before Ghatasthapana in many parts of the country as a way of celebration. These bamboo swings are called ‘ping’ in Nepali. These kinds of swings present the best of local culture, tradition, community spirit and fun. These swings are constructed with the help of community members using traditional methods which make the use of ropes made from tough grass, bamboo poles and wood etc. Theses swings are dismantled only after the festival of Tihar which is 2 weeks after Dashain. The heights of some swings exceed twenty feet and one can swing really high. One can see people of all ages enjoying the swing. It is especially famous with the children. Different kinds of fairs are also organized during the festival. Usually small fairs are organized in the villages with the Ferris wheels for children and other items of entertainment for the adults. However, in the city it is the commercial fairs and celebration events that are usually organized. My memories of Dashain fairs are of Bhrikuti Mandap Dashain Mela. My parents used to take my brother and me there and we were allowed to buy treats. They had concerts, dance shows, magic shows, family games, Band competitions, games, food, and a lot more. They also had stalls with goats, chickens, ducks etc. and great for people who want to buy animals to sacrifice for Nawami. Also these days they organise lots of musical concerts during these festivities. In Sydney, during Dashain there are lots of musical concerts with Nepali artists visiting down under to celebrate the festivals. Dashain festival and dance parties are also organised here to make merry and have a get together. This is probably the worst part of Dashain for me that thousands of animals such as buffaloes, ducks, goats, etc. are slaughtered during Dashain every year. It is considered an important ritual since it is believed that the goddesses are appeased by such sacrifices. Almost all the temples, especially the temples of Goddess Durga and Kali around the country are offered with thousands of sacrifices. Asthami and Nawami are the days when the sacrifices reach their peak. While thousands of animals are sacrificed to appease the goddesses, people also slaughter animals for the purpose of feasts. Since a large number of feasts and gatherings are organized throughout the fifteen days of the festival, the demand for meat goes up considerably. Hence to meet the demands the slaughtering of animals becomes considerably high during the festival. However, for the past few years the animal rights activists in the country have been continuously opposing these acts of slaughtering of animals in such a manner. They have been requesting people to stop such inhuman acts of killing the innocent animals and instead have suggested them to offer fruits and vegetables to the Goddesses since they believe that it is mentioned nowhere in the Hindu religious books that such sacrifices appease the gods and goddesses. I do know that we need meat from animals but I still think it doesn’t need to be cruel killing of animals for the meat. I am sure there can be less violent way of killing animals for their meat. As I am not into killing animals and also I can’t do that in Australia so I will be using coconut instead to mark Nawami. I will keep you posted about Dashain for the next 15 days. A relaxed mind, a peaceful soul, a joyful spirit, a healthy body; be a heart full of love, may you have all these every day. Happy Dashain everyone!!! 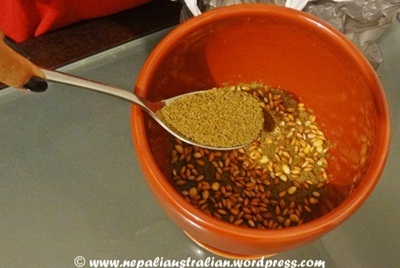 This entry was posted in Nepal, Nepali Culture, Nepali Festivals and tagged asuras, Bada Dasain, Bada Dashain, Changa Chet, culture, Dashain, Dashain 2012, Dashami, Dashera, Flying Kites, Fulpati, Ghatasthapana, goddess durga, hindu festival, How to plant Jamara, jamara, Kites, Maha Asthami, Maha Nawami, Nepal, Ping, Purnima, Ram Chandra, special weapons, Vijaya Dashami. Bookmark the permalink. Very clear.. I love reading this.. happy dashai 🙂 good health to each and everyone.. Very true, animal cruelty is the last thing i can tolerate too & it breaks my heart that people do it all in the name of god. Maa Durga, being a compassionate mother could have never tolerated cruelty meted out to her ‘other’ children too like the hapless lambs, buffaloes etc. May she bless the world with greater enlightenment. I agree with you Teju. I am sure any God of any religion will never advocated for taking a life in their honor. Hope it will stop one day. I love that I learn so much from visiting here, M! Thank you for such an in-depth description of the festival, and all the other topics you’ve posted – your blog is a treasure. This is the most wide coverage of the Dashain so far ! Every small detail is included and thankx for how to grow jamara . 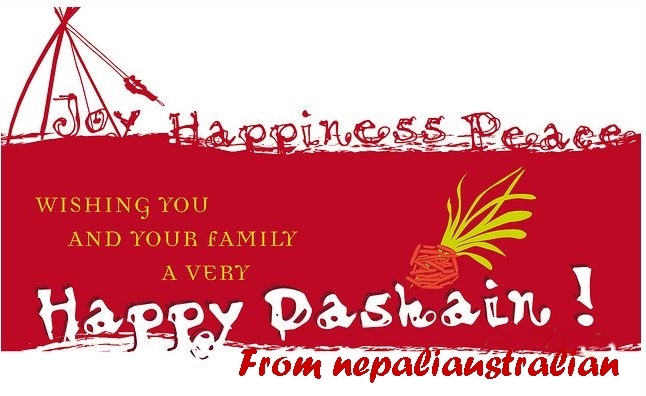 :-) happy Dashain to and ur family. Thank you for walking us through Dashain. So fascinating…the Jamara looks cool, and the swing, 20 feet! I can only imagine what I’d have done on one as a child.